I’m late to the game; I’m never late to the game, so I’ll act like I recently ate this meal. In all actuality it was sometime in December, Pre-Christmas. Before Chef Matt Wick received all the accolades that come with adorning the front page of Connecticut Magazine. Matthew Wick, flanked by long time bud Mike Denisiewicz and backed by Middletown pizza czars Kevin Wirtes and Rich Garcia, have carved a beautiful niche in the form of Osa. 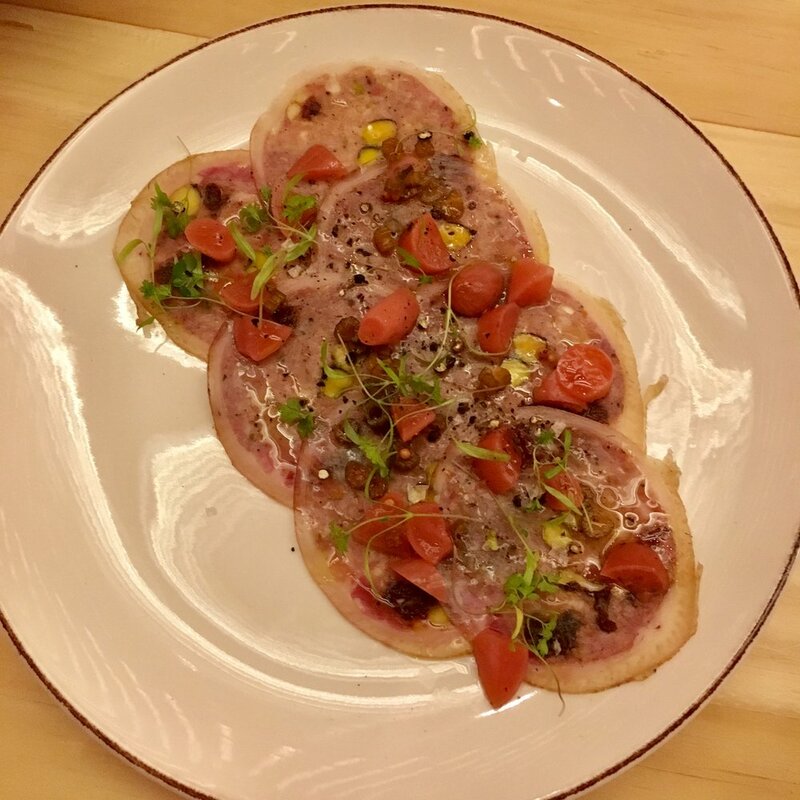 Unorthodox, progressive Italian in the form of small plates, Osa delivers a refined, flavorful punch that no other area restaurants seem to match. 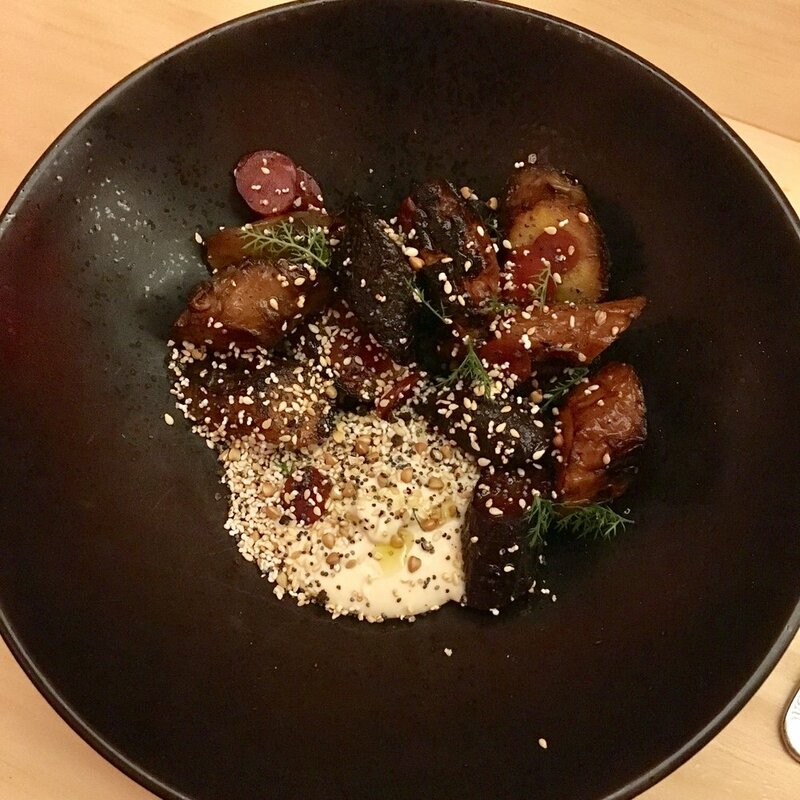 Chef Matt has earned himself a culinary canvas to which he can flex his favorite preserved and fermented dishes that most chefs are apprehensive to present to the general public. With a season driven, ever changing menu, Osa aims to appeal to all palettes, broken into snacks, share plates, large plates and desserts. Dominated with an unfinished wood, modern style, Osa is definitely the coolest looking restaurant in all of the Rt. 9 corridor, now let us talk about what we ate, shall we? First was the charred kale with roasted sunchokes, preserved mushroom, kale stem relish, meyer lemon dressing and sunflower seeds. I love a sunchoke and I was eager to see how Chef Wick was going to dress this dish up. Next was a staple that I always get and I don’t even know why, charred shishito peppers, with scallions, pickled pepper and hazelnut romesco. I love shishito because it’s like playing Russian Roulette. While they are not usually too hot, every once in a while you get the outlier that is packed chock full of seeds and it ruins your taste buds for the evening, but not this night. Next up was the smoked fish dip, not usually my favorite, this one was nice and tasty with picked vegetables, salmon roe and grilled caraway bread for dipping/smearing. Once we were done with that we were presented with the marinated mussels with charred turnip, tarragon buttermilk, horseradish, almonds herbs. This was nice because there was no work; you get to just eat mussels without having to do any shell work. I’ll have you know that we sampled 13 plates, so stay with me. Next we followed up with an excellent wood grilled octopus with charred fermented cabbage, leek and cherry pepper mayo, shaved ham and smoked tomato powder. This dish was phenomenal because these guys know how to cook octopus correctly. Next up was one of my favorite dishes of the night, smoked carrots with black garlic crème fraiche, puffed grains, carrot pickle and yarrow. This is why I love Matt, because I did not know what yarrow was so I did some research. Also known as achillea millefolium, yarrow, is a flowering plant in the family Asteraceae. It is native to temperate regions of the Northern Hemisphere in Asia, Europe, and North America. It has been introduced as a feed for livestock in places like New Zealand and Australia. However, it is a weed in those places and sometimes also in its native regions. In New Mexico and southern Colorado, it is called plumajillo (Spanish for 'little feather') from its leaf shape and texture. In antiquity, yarrow was known as herbal militaris, for its use in stanching the flow of blood from wounds. Other common names for this species include gordaldo, nosebleed plant, old man's pepper, devil's nettle, sanguinary, milfoil, soldier's woundwort, thousand-leaf, and thousand-seal. Next was a nice delicata roasted with sage and served with sea-change cheese, apple, spruce honey, toasted seeds and autumn olive capers. Next up was some wonderful Melinda-Mae under lonza, pickled pears and onions, walnut syrup and wild allspice. Do you know what a pork trotter is? I didn’t until this night. The pork trotter was stuffed with pistachio and dried cherry sausage served with radish, celery and mustard seed relish. Next was the baked semolina gnocchi served in a skillet, but beware, this was not your frickin grandmas gnocchi! I don’t know how they did it and I’m not going to speculate but the gnocchi was prepared differently. In the skillet were two large, flat pieces, about the size of a slider-size piece of beef, laid flat and side-by-side. Served with spicy sausage ragu, Melville fonduta, fried garlic, herbs and Calabrian chili, this was my favorite dish of the night; I could have eaten about 5-6 of these. Now it was time for dessert and I knew Osa would not disappoint. For a while they had been featuring some test dishes in the Krust kitchen and I was privileged enough to had tried some. One of my favorites was this ricotta and cherry dessert. This was not on the menu but there were two treats that were just as good. First was the wood-roasted apples with bourbon caramel, woodruff cream and almond crostata. This was damn good, seasonal and fresh, one of those kinds of desserts that I would try to make at home… and fail! Second was dark chocolate mousse with strawberry preserves, pistachio brittle and salted cherry blossoms. From the looks of this dish I thought it to be maybe like a pot de crème but no, it was more of a thick pudding consistency topped with crunchy texture with a fruity essence and finish, perfect taste to leave with. I had Matt on my podcast last year before Osa opened and he gave a nice little preview of the menu and what the restaurant would be like. I asked Matt how he came up with the name and he told us a very cool story. In short, When Matt spent some time in Italy a while back he stayed on a farm and studied all types of Italian cooking. Osa was the name of the farm pig that matt would hangout with everyday. Osa turned into Matt’s best bud for the time he was in Italy, so the naming of the restaurant was an ode to her. Osa is a gem and if you call yourself a foodie you need to make a reservation.